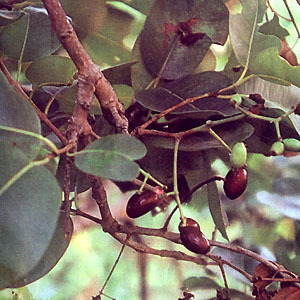 A duhat tree is about 8 to 14 meters high with white branchlets and reddish young shoots. Leaves are broad-tipped, opposite, shiny and leathery, ellipitic, 6 to 15 cm long. Flowers, small, pinkish, in clusters, petal arranged to form a cup. Fruit is oval, 1 to 2 cm long, dark purple to black, fleshy and one-seeded, with a sweet-astringent taste. Duhat is a fruit tree found mostly wild throughout the Philippines. Duhat seeds are known for the treatment of diabetes, as are the leaves and the juice from the fruit. The bark is astringent and in decoction is used as a mouthwash and as a gargle for ulcerations of the mouth. Diarrhea: Liberal amounts of the fleshy portion of the fruit. Gum gingivitis: Use a 1% decoction of the bark as a gargle or mouthwash. Wounds: Use the bark decoction as an astringent wash. In India, seeds used for diabetes. Bark used for sore throats, indigestion, appetite loss, leucorrhea, bronchitis, asthma, ulcers and dysentery. This entry was posted in List of Medicinal Plants in the Philippines and tagged duhat, java plum on March 12, 2009 by Pinoy Herbs. yah, better try these, very informative & effective…. Where can I buy dried duhat fruit or duhat fruit in powder form? I’m very interested to buy ‘cos I’d like to share them with my family who are identified as type 2 diabetics.